JIt was a perfect fall morning—sunny with low humidity—the kind of weather we convertible drivers in Florida live for. My sky-blue Solaris cruised along the two-lane road where a canopy of majestic, moss-draped live oaks resembled a crown, fitting I think, since the island was named for Princess Amelia, daughter of King George II. Near the tip of the island, I turned off at the entrance to Omni Amelia Island Plantation Resort (omnihotels.com/AmeliaIsland). After passing through the gates, I drove to the guest check-in along meandering lanes edged with undulating paths that played hide-and-seek among Amelia’s tree hammocks and wild thickets. During past visits, my husband, John, and I loved cycling on the countless trails that crisscross the resort’s 1,350 acres of wildlife-rich salt marshes, pristine golf courses, and towering sea oat–covered dunes that unfurl to vast Atlantic beaches. 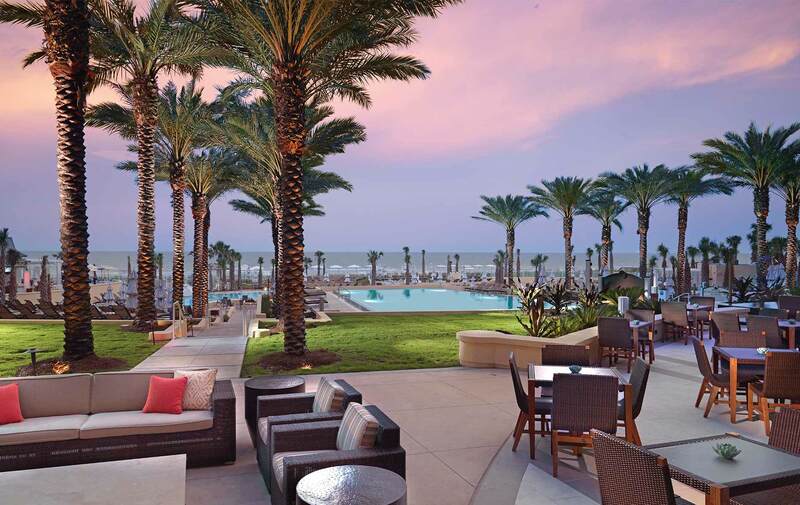 In March 2013, the 40-year old resort began a refreshing new chapter with the completion of an $85 million reimagination by its new owners, Omni Resorts. The four-hundred-room AAA Four Diamond hotel that resulted is a stunner. Driftwood pieces artfully dangle from the lobby’s exquisite ceiling motif. Floor-to-ceiling windows overlook a spectacular multilevel pool deck with lush palms and water and fire features that reminded me of Maui’s chicest resorts. I stayed in the new Oceanside wing. My beautifully appointed room had a luxurious bed; soothing coastal blue, green, and light wood accents; and stellar panoramas from the private balcony. Chef Daven’s farm-to-fork philosophy and anti-pomp-and-circumstance approach brings his menus down to earth, which is especially refreshing considering he hails from some of Chicago’s most star-studded kitchens, like Tru, the city’s most elite AAA Five Diamond Award winner, and the Pump Room, Omni’s AAA Four Diamond recipient. Weathered shrimp boats bobbed in Fernandina’s small marina alongside sightseeing boats that cruise around neighboring Cumberland Island, Georgia (cumberlandisland.com), which is famous for its wild horses and for being the site where JFK, Jr. and Carolyn Bessette secretly married in 1996. The Amelia Angler II (ameliaangler.com) was also docked here and waiting to take us on a “reel” adventure to catch our dinner. Already aboard were our hosts, golf pro-turned-angler, Captain Terry Lacoss and his son, Captain Terry David (T.D. ), who are ranked among the country’s top father-and-son fishing teams, having won a slew of bass, kingfish, and redfish competitions. With the Verandah’s head chef, Chris Pickren, and his culinary team, Chef Daven dazzled us with a multicourse masterpiece that was as visually enticing as it was delicious. Starters included a bounty of freshly caught local shrimp, Apalachicola oysters, and spiny lobster. Rather than fight the day’s choppy seas, our captains suggested we try our luck in Amelia’s calmer brackish backwaters. Situated at the confluence of four rivers and the Atlantic Ocean, these deep, rich channels are prolific with redfish, grouper, snapper, flounder, and cobia. However, when we cast our lines, it was “Sharknado” mania. Yes, we were fishing smack-dab in the middle of the Shark Breeding Capital of the Southeast! Bonnetheads, hammerheads, and Atlantic sharpnose “sharpies,” oh my! For the next several hours, we reeled in more than a dozen sharks (two is Florida’s limit), two behemoth bull redfish (sadly, they easily exceeded the twenty-seven-inch maximum), and a decent-sized stingray, which turned out to be our tastiest catch. Afterward, while the rest of us freshened up and relaxed, Chef Daven was hard at work at the Omni’s restaurant, the Verandah, which specializes in Southern-inspired fare and fresh seafood and is the most elegant of the nine resort restaurants he oversees. With the Verandah’s head chef, Chris Pickren, and his culinary team, Chef Daven dazzled us with a multicourse masterpiece that was as visually enticing as it was delicious. Starters included a bounty of freshly caught local shrimp, Apalachicola oysters, and spiny lobster. Our sweet and savory salad course paid homage to my home state and featured Georgia peaches, cheese, and pecans from nearby orchards and farms. Next, we feasted on the fruits of our labor: tender shark medallions with parsnips and black garlic. This was followed by delicately sautéed skate wings (a.k.a. stingray, Chef Daven’s favorite fish to cook—and my new favorite to eat) in a brown butter caper sauce served with homemade tomato-basil gnocchi. Dessert was a fanciful vanilla-orange tart consisting of a sorbet-filled fresh orange, topped with champagne sabayon (a frothy sauce made with egg yolks, sugar, and champagne), and served with two vanilla cream tarts. Beautiful driftwood ceiling above the foyer of the newly renovated and expanded hotel at Moni Amelia Island Plantation. If our dinner had been a ballroom dance and the food was Fred Astaire, then the wine was surely Ginger Rogers. The resort’s director of food and beverage, Chris Walling—whose palate proved to be in a league of its own—orchestrated the best wine ensemble I’ve ever tasted. Though I’m usually a loyal lover of reds, I became equally smitten with all of these varietals: Veuve Clicquot Yellow Label Champagne, Darioush Viognier (2011), PlumpJack Reserve Chardonnay (2009), and EnRoute Les Pommiers Pinot Noir (2010). And for our swan song, we gathered around a cozy fire pit on the patio of Seaglass lounge to enjoy nightcaps and smooth stogies under the stars. More than caffeine awakened my senses the next morning during our breakfast at the Marsh View Bar and Grill, which overlooks the marsh, the Intracoastal Waterway, and the ninth hole of Oak Marsh Golf Course. Vibrant orange and yellow calla lilies were swirled in glass bowls and placed in the center of the table. Beside each place setting was an edible checkerboard created from blueberries and fresh-cut honeydew and watermelon. The sweet aroma of Chef Daven’s banana-nut French toast infused with banana-chip essence trailed up from my plate and perfumed the air. I couldn’t help but think, Dorothy, you’re not at Denny’s anymore. The Verandah's casual but elegant dining room draws inspiration from the coast. 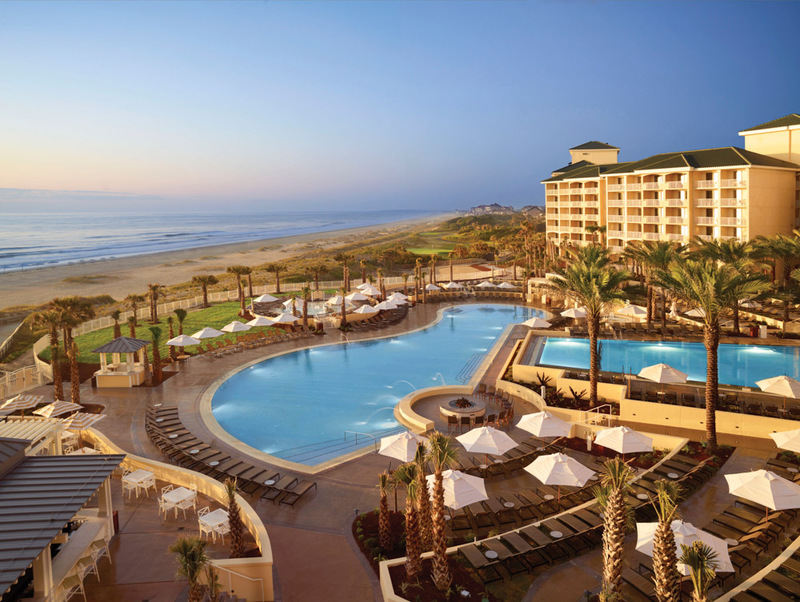 Photo courtesy of Omni Amelia Island Plantation. Following breakfast, I fulfilled one of my bucket-list musts and took a Segway tour with my colleague, Mike. Neither of us had ever ridden a Segway, but I figured, heck, how tricky could it be? As it turned out, trickier than I thought. Just ask the poor, unsuspecting Segway rider that I was following behind. While I was still trying to get the hang of it, I sped too fast down one of the resort’s particularly steep hills and careened into his back. Luckily, my good-humored victim from Charlotte, Peter Dent—yes, that’s his real name—managed to keep his balance. I, however, did not, but I only got a scratch. The rest of the tour was a breeze as we dipped up and down and skirted around the scenic beach bluffs and salt marshes. Throughout the remainder of my stay, I repeatedly ran into Peter and his lovely wife, Kathy—though strictly figuratively—and, bless their hearts, they couldn’t have been nicer. After our death-defying 10 mph adventure, we had worked up an appetite, so we grabbed a bite at Marché Burette, the resort’s charming gourmet emporium, which Chef Daven described as “Cracker Barrel meets Whole Foods.” We enjoyed a light lunch on the shady terrace overlooking a pond and the small shopping village. On the walk back, Chef Daven passed by on his bicycle while doing his rounds. Not only does he physically visit all nine of his restaurants and eateries daily but he also stays fit in the process. Chef Daven Wardynski with a bull redfish he caught and released aboard the Amelia Angler ll with Capt. Terry Lacrosse. With the hot sun bearing down, I could hear Omni’s ultraluxe pool calling my name. As I wandered among six hundred chaises dotting the palm-fringed, multitiered poolscape, I felt like Goldilocks on a quest to find the perfect sunny perch. When I took a gloriously refreshing dip, I nearly had the pool to myself—ahhhh, the sweet rewards of off-season travel. I then moseyed out to the beach and watched the crashing waves. Hoof- and footprints were mingled together in the sand, reminding me of Amelia Island’s popularity as a horse-friendly beach. Though I wished to linger, I didn’t want to be late for our seven-course degustation at Oceanside Bar and Grill. The resort’s most popular restaurant specializes in fresh Floribbean cuisine. It is flip-flop casual by day and glams it up a few notches at night. Our evening extravaganza kicked off with sunset cocktails in the lobby’s sleek lounge, Seaglass. Afterward, we walked down along the cascading pool decks to Oceanside for an indulgent evening of culinary seduction. Oceanside’s inviting atmosphere was casual coastal chic. Beautiful white calla lilies and blue glassware graced our table, and large open shutters invited a cool breeze inside. Along with Chef Daven’s customary welcome and tantalizing course-by-course description of the evening’s menu, he also explained the inspiration behind his “Florida–Georgia Border” themed dinner. He said the focus was to raise awareness of the impact that local harvests have and to emphasize their effects on the surrounding ecosystems of his adopted home. Furthermore, by unifying the borders of these neighbor states, Amelia Island’s future and existing natural habitats can be better protected. Not only does Chef Daven prepare exquisite cuisine, but he also excels at putting clever twists on his imaginative creations. During the course of events—pardon the pun—he surprised us with unlikely flavor pairings, scent infusers, and playful visuals. In fact, if presentation were an Olympic sport, Chef Daven would surely take home the gold! The first course, “Ice Breaker,” was one of most scrumptious—a chilled spiny lobster that had been sliced into portions, reassembled on a four-sectioned rectangular plate, and served with edamame and a sweet habanero sauce. The “Island Bridge” salad was two large spinach leaves placed atop a few mushrooms and some roasted corn, all sitting on a sweet pea puree ribbon and hominy flan. Chef Daven displayed his sense of humor—literally—with his “Rod and Reel” course. Luscious Florida tuna sashimi mixed with cashews and pickled shishitos (sweet Japanese peppers) were served in a small tin can and accompanied by a scoop of delectable basil ice cream. Another standout was the “Line and Net”—she-crab soup ladled into an oversized spoon rest and decorated with clumps of crabmeat, Granny Smith apple slices, and salmon roe sprinkles. The “Campfire” was an enchanting variation of s’mores. A slice of chocolate mousse cake, homemade graham crackers, and toasted marshmallows were arranged and plated behind a tiny cast-iron skillet filled with smoldering hickory chips. The smoky aroma wafted under my nose with each incredible bite. Genius! After seeing what my comrades returned with (assorted vegetables—kale being the most exotic, homemade carrot cake jam, pink peppercorns, squid ink pasta, and a twenty-dollar bottle of black garlic balsamic vinegar, which according to the vendor is the “world’s only”), I felt like I had gone a tad overboard. My shopping bag held spicy boiled peanuts, popped kettle corn, chia seeds (from the chia plant, they resemble black sesame seeds and have a nutlike flavor), saffron noodles, cacao nibs (bits of roasted cacao “chocolate” beans separated from their husks), and the ultimate curve ball, a bottle of Smurf-colored cream soda. I quickly made a beeline to the resort’s famous Saturday morning Bubble and Biscuit Bar, held dockside overlooking the pond. I was full from nibbling my way around the market, but I’m always up for a glass of champagne. Nestled in the midst of a cascading display of greenery and driftwood were enticing fresh fruit puree infusers for flavoring the bubbly—mango, blueberry, strawberry, ginger, and passion fruit—plus yummy melon ball skewers. While I was chillin’, things were heatin’ up at Bobby’s biscuit bar, where fluffy buttermilk “catheads” were filled with a choice of hot-off-the-griddle ham, sausage, bacon, cheese, and egg. With a few hours to kill, I engaged in some of the resort’s retail therapy and discovered Red Otter Outfitters (redotter.net), which offers terrific travel and adventure wear. Even better, they were having a 60 percent off sale—score! The gorgeous view from my room in the Omni's new oceanside wing overlooking the pool deck and the Atlantic. Photo couresy of Omni Amelia Island Plantation. The Chef's challenge throwdown kicked off with a delicious bowl of spicy boiled peanut minestrone. 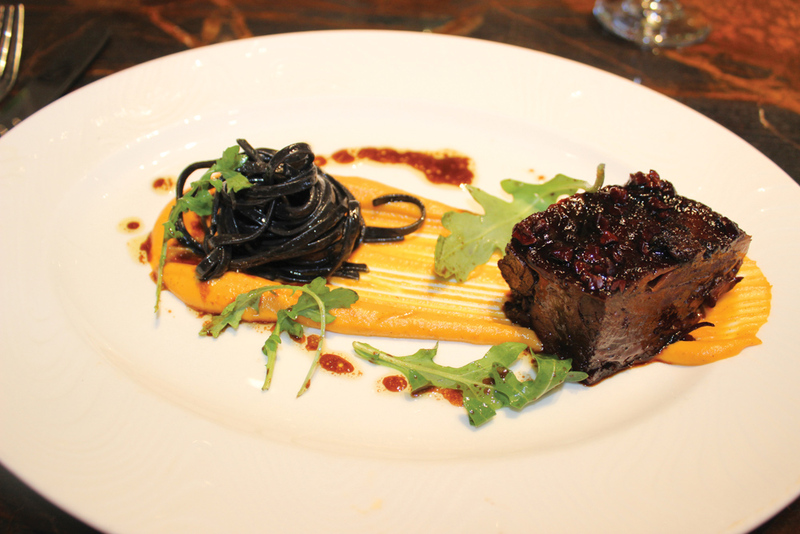 The Chef's challenge main course masterpiece was a cacao-and-coffee braised short rib with squid ink pasta, YUM! Before I knew it, it was time for the big event at the Chef’s Kitchen, located in the hotel’s Sunrise Wing. The intimate, oceanfront-dining venue accommodates private parties up to twelve and has hardwood floors and a bright, airy beach-house feel. Cohosting with Chef Daven were Chefs Brennan Pickren and Todd Ruiz. Menus at each place setting listed the courses with the incorporated ingredients and the names of those who had provided them. 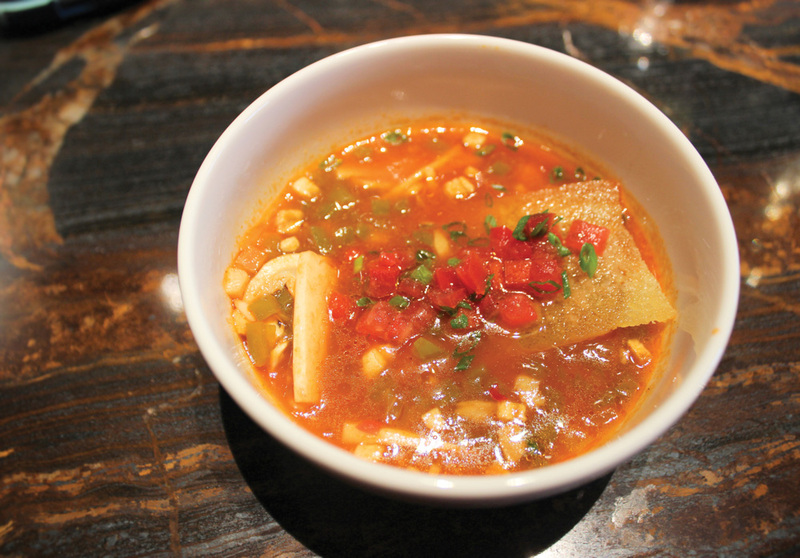 Our first course was a flavorful Southern-style minestrone—with attitude. Organic tomatoes and bell peppers were combined in a rich broth with spicy boiled peanuts (in lieu of chickpeas) and bite-size saffron noodles. This amped-up version ran circles around the classic zuppa. Surprisingly, Chef Daven hadn’t named our spinach and kale salad “the Curve Ball,” but that’s where many of my ingredients appeared. Dark, leafy greens were gorgeously presented in an elongated wooden bowl, drizzled in a sweet and tangy sky-blue vinaigrette, and sprinkled with fluffy kettle corn, kale chips, and wafer-thin chia seed crackers. Touché! The main course was a real plate scraper: a fall-off-the-bone cacao-and-coffee-braised short rib, squid ink pasta served atop a swath of whipped sweet potatoes, and arugula drizzled in black garlic vinegar. Last and oh-so-sweet was a carrot cake “whoopee pie” filled with cream-cheese frosting and carrot cake jam and accompanied by homemade brittle. Bravo! After several rounds of toasts and thunderous applause, our incredible “slow foods” sojourn came to a bittersweet end. Amelia Island has long been one of my favorite getaways, and I now have many more reasons to keep returning. Not only has Chef Daven raised the culinary bar to a whole new level, but I will also never look at blue cream soda the same way again.